I recently came across an Associated Press of Pakistan story in a leading national newspaper which was based on a document sourced from the Ministry of Information Technology and Telecommunications (MoIT&T). The title was Pakistan IT services exports rose 97.34% in the last five years. It further claimed that the Ministry claimed in the National Assembly that IT services exports will increase by 271% in the next five years totaling US$ 3.77 billion. The following table documents the past and projected figures quoted by the Ministry based on information sourced from Pakistan Software Export Board (PSEB). Since I find myself quoting these figures often, I wanted to cross-check the numbers against those reported by the State Bank of Pakistan. The following figures shows the export revenues compiled against Computer and Information Services as reported in State Bank of Pakistan documents for the previous ten years. The first thing that jumps out is a gradually increasing divergence between the State Bank numbers and MoIT&T/PSEB numbers for the past years. The difference has grown from US$ 18 million in 2008-09 to US$ 40 million in 2012-13 with the PSEB reporting a consistently higher figure. I went through considerable research to figure out if this difference can be accounted for somehow, and realized that SBP allocates Call Center service export under a separate head in its BoP reporting. PSEB and MoIT&T is therefore adding the Call Centre service exports as reported by SBP to the IT Services exports to arrive at cumulative export figures of IT and IT enabled Services (ITeS) like BPO and outsourced call centers. Since India includes BPO exports to the IT services exports, that’s a reasonable thing to do when reporting Pakistan IT export figures. 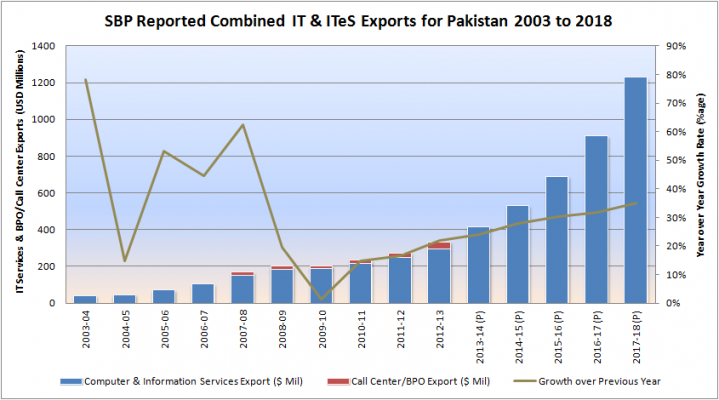 The following figure depicts the Pakistani IT and ITeS exports and corresponding growth trend over the past 10 years and the future projection of MoIT&T into one graphic. One thing that became painfully obvious during the research was that there is no official, stated policy for export recognition by PSEB or the MoIT&T. The numbers and policies cited by PSEB over the past few years are all over the map ranging from “rules of thumb” to “survey based analysis” to “80:20 rule” based guesses. According to this PSEB document, the figures for FY 2008 IT exports ranged from US$ 469 million to US$ 762 million depending on which methodology is used. Both of these are a far cry from the US$ 169 million figure recently quoted by PSEB to MoIT&T. This clearly depicts a very confused state of affairs at PSEB as the same data reported at two different occasions does not match with each other. After reviewing several documents, press reports and policy documents listed in the notes with this article, it is clear that the size of Pakistani IT and ITeS exports is much larger than the official figures quoted above. A study by Bearing Point in 2005-06, states that 3 out of every 4 dollars earned in IT exports remains outside the country. That would peg the current size of IT and ITeS exports to 334 x 4 = US$ 1,336 million. I believe that’s a gross over-estimation. Another document prepared by Technomics for PSEB in 2010 provides a much better perspective and guidance for estimating the size of the Pakistani IT industry based on comparisons with India and Ireland. The study suggests that the best way to estimate the size of the industry is through representative surveys of companies operating in the industry. Based on that survey, and after correcting for non-response bias, it was estimated that the size of IT exports in Pakistan ranged from US$ 469 million to US$ 762 million while the local spend on IT in Pakistan ranged from US$ 227 million to US$ 393 million. Technomics estimate of Pakistan IT industry. Image linked to original report. I am personally inclined to use the lowest estimate of US$ 469 million from this study to estimate total Pakistani IT exports in FY 2008. Primarily because the “India RBI Model” based methodology explained in the report seems most reasonable to me. There is another reason for that. This report claims that according to a survey conducted in the same period, 75 of the largest software houses reported a total of 7,500 full time staff employed with them. I am assuming another 5,000 were employed by around 1,000 or so much smaller registered software houses at the time (on average 5 employees per company) who did not respond to the survey. Since the Pakistani IT export industry is predominantly service based, using US$ 35,000/head/year annual service revenue would peg the exports at approximately US$ 438 million. Similarly, for domestic spend, I am also inclined to believe that the estimate of US$ 249 million seems most reasonable as derived by the India RBI Model in the study. Applying the same 2008 multiples (2.78 times SBP numbers for exports and 1.47 times SBP numbers for domestic spend) to the FY 2013 exports reported by SBP, my guess is that actual FY 2013 IT and ITeS exports stand at approximately US$ 929 million and domestic spend is approximately US$ 491 million. That will peg the total IT and ITeS industry of Pakistan at approximately US$ 1.4 billion today including exports as well as domestic spend and excluding hardware revenue. As a side note, the freelance IT economy in Pakistan is on the rise also. Based on unofficial figures obtained through private discussions with various online freelancing outfits, Pakistan based freelancers raked in anywhere from US$ 50 million to US$70 million in 2012-13. Unfortunately only 10%-20% of this gets into Pakistan as export revenue and the rest either stays outside or doesn’t get recognized as IT export revenue. As is clear from the text of the article that these are simply estimates and guesses based on rules of thumbs and extrapolation of studies done over 5 years ago. There is a dire need to conduct another survey of Pakistani IT industry to arrive at better numbers. It is my understanding that Pakistan Software Houses Association (P@SHA) is in the process of conducting such a survey and I look forward to its findings. Until then, however, I plan to use these numbers for quoting the size of Pakistani IT industry when needed. I’d love to hear what you use for estimating the size of Pakistan’s IT industry. Please leave a comment if you have a thought on the subject. What is the govt doing to promote the IT sector?